Shern was having surging high fever the night I came back from KL. His temperature went as high as 39.2 °C (that's 102.56 °F) . I was sweating as much as him. I was sweating with fear. After 2 doses of paracetamol and his fever was still hovering at 38.6-38.8 °C, hubby and I sent him to the hospital at 9am on a Saturday. 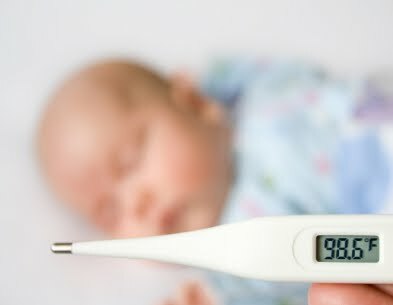 He was admitted straightaway after arrival when the nurse took his temperature which shows 38.8 °C. Doctor checked on him and found no rash, no marks, no sore throat, nothing. Which means that it is not HFMD. Dr. Chiah needed Shern to take a blood test to confirm that it is not dengue fever. It was a painful process to watch 2 nurses holding Shern down while 3 ml of his blood was being taken with Shern howling the place. Shern was very, very whiny and very, very clingy to me. He refused his milk from the bottle. He only wants my breasts. He refused all food. He refused water. In the end, I had to feed him water using a syringe which he cries everytime I feed him. I could not leave the hospital. Hubby and the rest came and went. But I couldn't leave. I am very thankful that most of the time, there is someone here with me, usually my hubby during the day and ah-yee at night. This enables me to eat, go to toilet and sleep while knowing that Shern is being attended to. Today he is better. He ate half a banana, mashed. And also drank milk from the bottle once. However, his cranky-ness is still at its peak. I hope both of us can go home tomorrow. Poor thing, I hope he recovers soon. Hugz. Sounds like its under control. But do keep us updated on how he goes. 1. It came suddenly badly. 2. The doctors can't give him antibiotics because its not bacterial, so please don't go asking for antibiotics. a) they don't know what type of viral fever... which is normal and not that they are incompetent, but probably means they're just treating his symptoms and MAYBE giving him broad antivirals. I would prefer if they just treat his symptoms. munyi n MY...thanks a lot! shuey...yeah. thanks for the info and the comforting words. shern is at home dee..YAY! but still having fever. monitoring his fever at home. im thankful he is not on drips..otherwise it is very difficult to care for him. actually unless he's having diarrhea, drips isn't going to help him much anyway. wish him speedy recovery so his mum also will feel better. OMG...Hope that he is getting better. I had a friend whose son is also down with viral fever. She gave him B-Propolis. It's an organic food which strengthen their immune system. He get well very soon then. You can try to look search for it. It's recommmended by most mum from agilent to their baby after 1 years old. if he's already sick, it's unlikely that trying to "strengthen his immunity" now will help much. because this means that Shern's body is learning for the first time to fight off infections and he will be more able to fight infections next time compared to babies who haven't been sick.